This well preserved coin belongs to the collection of Mr. Bogdan Costin, through the kind permission of whom the pictures are present on Romanian coins. A variant of Radu's ban have a Cyrillic letter Γ - a G - in the center of the obverse, instead of the sun on the common variant. The pictures are present on Romanian coins through the kind permission of Mr. Kurt Ellenberger. 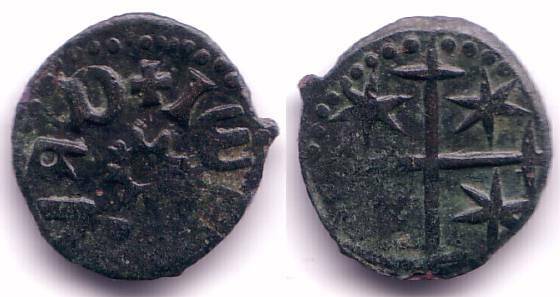 This coin was issued by Radu I (~1377 - 1383), brother of the famous Vlaicu I (1364 - ~1377) and father of the glorious Mircea the Old. This voivod (reigning prince) achieved for the first time for him and his descendants the title of Great Voivod (appearing on coins also). Yet short reigned, a large variety of silver coins comes from his period. As a type this coin is known to Romanian numismatics as Walachian ban, coins that largely complied in weight and title with the silver denarii struck by the bans of Slavonia (nowadays in Croatia). These denarii, known as denarii banales, were made of a good alloy that did not change for a peculiarly long period of time. From these coins struck by Slavonian bans the Romanians have until now the word "ban" ("bani" in plural), meaning nothing less than money. 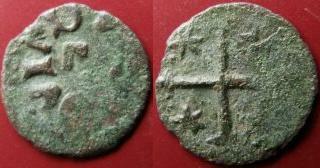 The ban was equal to a half denarius or obol of the Hungarian kingdom. The item in the pictures is atypical because Slavonian denarii banales were struck in silver and so should have also been struck all coins complying to their system. This coin is made of billon or something worse. The Walachian bani had an average mass of 0.35 g. In which concerns its pattern (obverse - reverse), the first coin on this page belongs to type III Radu I ban, position 78a and 78b of the Bible of Romanian numismatics, Monede şi bancnote româneşti by George Buzdugan, Octavian Luchian and Constantin Oprescu (1976). This praised catalogue quotes the bani from Radu I as made of silver, most probably mistakenly. The legends on the coinage of Radu I were written both in Latin and Cyrillic (Slavic). This one uses a mixture of letters of both.